Does the Presence of Laparoscopic Colorectal Surgery Capability Reflect Greater Presence of Other Hospital-level Structures of Care? INTRODUCTION – Surgical treatment is the cornerstone of the management of colorectal cancer (CRC). However there is enormous variation in both the patterns of surgical care and patient-level outcomes. “Structures of care” are the resources and organizational arrangements in place where care is delivered, including the facilities, equipment, services, and manpower available. We explored whether the presence of laparoscopic colorectal surgery capability was associated with hospital-level structures of care. METHODS AND PROCEDURES – Using a population-based cancer registry, we identified all patients undergoing CRC surgery from 2003-2006. We then linked data from administrative health databases in Ontario to identify all hospitals performing CRC surgery, and measured multiple hospital-level structures including availability of diagnostic imaging, endoscopy, specialists, ICU characteristics, hospital size, and geographical characteristics. RESULTS – 20,784 patients underwent CRC surgery over our study period. Each year, between 106 and 109 hospitals performed at least one CRC operation. Of these, between 29 (26.6%, in 2003) and 66 (60.6%, in 2006) performed at least one laparoscopic CRC operation. Of hospitals performing any laparoscopic CRC surgery in 2006, 92.4% of hospitals were located in urban area as compared with 83.7% of hospitals that did not perform CRC surgery. 100% of academic hospitals performed laparoscopic CRC surgery, whereas 55.7% non-academic hospitals performed laparoscopic CRC surgery. In 2006, at the hospitals performing laparoscopic CRC surgery had more availability of computed tomography (CT) scanners (84.9 % vs. 41.9%, P<0.001), Magnetic Resonance Imaging (MRI) scanners (59.1% vs. 6.9%, P<0.001), an intensive care unit (ICU) (81.7% vs. 32.6%, P<0.001) and interventional radiology services (77.3% vs. 32.6%, P<0.001). CONCLUSION – There are major differences in the availability of structures of care at hospitals performing laparoscopic colon resections and hospitals that do not perform laparoscopic colon resection. 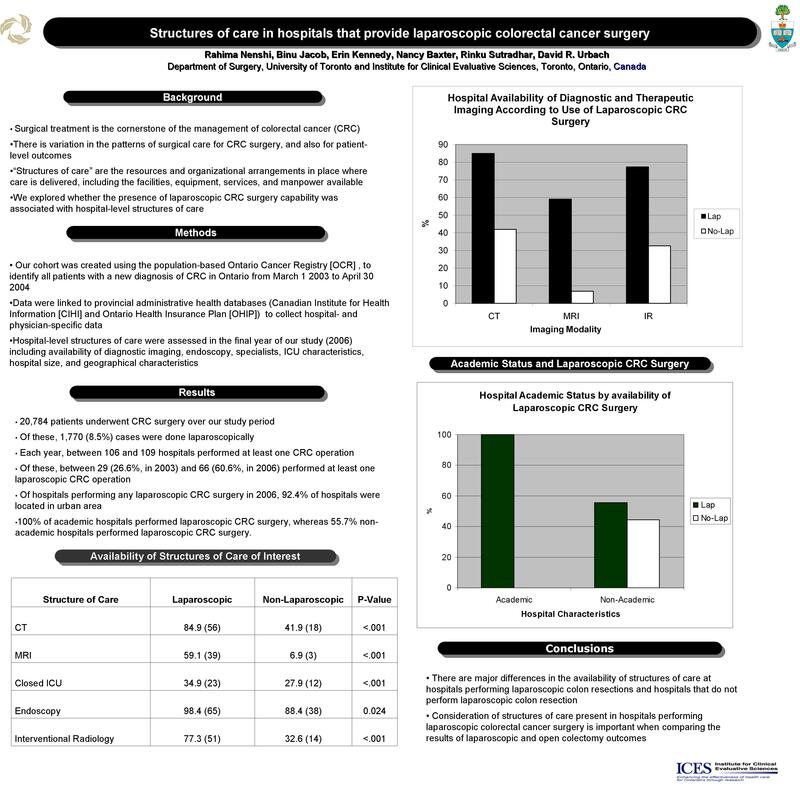 Consideration of structures of care present in hospitals performing laparoscopic colorectal cancer surgery is important when comparing the results of laparoscopic and open colectomy outcomes.